(February 9, 1914 – January 2, 1986), also known as “Sport Shirt”, was an American Major League Baseball franchise owner and promoter. After marrying Mary Frances Ackerman, Veeck bought an 80% stake in the St. Louis Browns in 1951. Hoping to force the NL’s St. Louis Cardinals out of town, Veeck hired Cardinal greats Rogers Hornsby and Marty Marion as managers, and Dizzy Dean as an announcer; and he decorated their shared home park, Sportsman’s Park, exclusively with Browns memorabilia. Ironically the Cardinals had been the Browns’ tenants since 1920, even though they had long since passed the Browns as St. Louis’ favorite team. Nonetheless, Veeck made a concerted effort to drive the Cardinals out of town. Some of Veeck’s most memorable publicity stunts occurred during his tenure with the Browns, including the appearance on August 19, 1951, by Eddie Gaedel, who stood 3 feet 7 inches tall and is the shortest person to appear in a Major League Baseball game. Veeck sent Gaedel to pinch hit in the bottom of the first of the game. Wearing elf like shoes and “1/8” as his uniform number, Gaedel was walked on four straight pitches and then was pulled for a pinch runner. He was the man who brought a midget to home plate and explosives to the outfield of Comiskey Park. 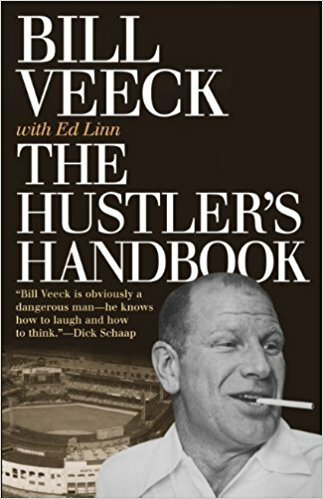 But beyond the flash, legendary owner Bill Veeck’s open-minded approach brought positive changes to the game of baseball. 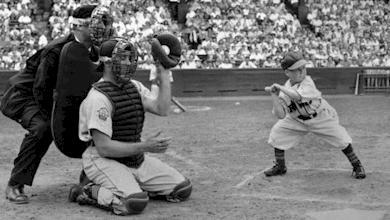 On Aug. 19, 1951, a 3 foot 7 inch man named Eddie Gaedel walked to the plate as a pinch hitter for the Browns. Wearing the uniform number “1/8,” Gaedel used his miniscule strike zone to draw a walk on four pitches. He was promptly replaced for a pinch runner at first base, completing his day as the shortest man to ever play in the major leagues. Veeck was just four years old when his father, sportswriter William Veeck, Sr., was named president of the Chicago Cubs. As a teenager, the younger Veeck learned about team management while he worked multiple jobs as a vendor, ticket salesman and junior groundskeeper. In 1941, Veeck partnered with former Cubs star Charlie Grimm to buy the Triple-A Milwaukee Brewers. Arriving in Milwaukee with just 11 dollars in his pocket, Veeck put his creative mind to work. He gave away live animals during Brewers games, scheduled morning games for night-shift workers and staged weddings at home plate. Five years and three American Association pennants later, Veeck sold the Brewers for a $275,000 profit. After the 1952 season, Veeck suggested that the American League clubs share radio and television revenue with visiting clubs. Outvoted, he refused to allow the Browns’ opponents to broadcast games played against his team on the road. The league responded by eliminating the lucrative Friday night games in St. Louis. A year later, Cardinals owner Fred Saigh was convicted of tax evasion. Facing certain banishment from baseball, he was forced to put the Cardinals up for sale. Most of the bids came from out-of-town interests, and it appeared that Veeck would succeed in driving the Cardinals out of town. However, just as Saigh was about to sell the Cardinals to interests who would have moved them to Houston, Texas, he instead accepted a much lower bid from St. Louis-based brewing giant Anheuser-Busch, who entered the picture with the specific intent of keeping the Cardinals in town. Veeck quickly realized that the Cardinals now had more resources than he could even begin to match, especially since he had no other source of income. Reluctantly, he decided to leave St. Louis and find another place to play. As a preliminary step, he sold Sportsman’s Park to the Cardinals. At first Veeck considered moving the Browns back to Milwaukee (where they had played their inaugural season in 1901). Milwaukee used recently-built Milwaukee County Stadium in an attempt to entice the Browns. However, the decision was in the hands of the Boston Braves, the parent team of the Brewers. Under major league rules of the time, the Braves held the major league rights to Milwaukee. The Braves wanted another team with the same talent if the Brewers were shut down, and an agreement was not made in time for opening day. Ironically, a few weeks later, the Braves themselves moved to Milwaukee. St. Louis was known to want the team to stay, so some in St. Louis campaigned for the removal of Veeck. Edward Carl Gaedel (June 8, 1925 – June 18, 1961) was an American with dwarfism who became famous for participating in a Major League Baseball game. Gaedel (some sources say the family name may actually have been Gaedele, which is the name seen on his gravestone) gained recognition in the second game of a St. Louis Brownsdoubleheader on August 19, 1951.Weighing 65 pounds (29 kg) and standing 3 feet 7 inches (1.09 m) tall, he became the shortest player in the history of the Major Leagues. Gaedel made a single plate appearance and was walked with four consecutive balls before being replaced by a pinch-runnerat first base. His jersey, bearing the uniform number “​1⁄8”, is displayed in the St. Louis Cardinals Baseball Hall of Fame and Museum. Due to his size, Gaedel had worked as a riveter during World War II, and was able to crawl inside the wings of airplanes. He was a professional performer, belonging to the American Guild of Variety Artists (AGVA). After the war, Gaedel was hired in 1946 by Mercury Records as a mascot to portray the “Mercury Man.” He sported a winged hat similar to the record label’s logo, to promote Mercury recordings. Some early Mercury recordings featured a caricature of him as its logo. Browns’ owner Bill Veeck, a showman who enjoyed staging publicity stunts, found Gaedel through a booking agency. Secretly signed by the Browns, he was added to the team roster and put in uniform (with the number “1/8” on the back). The uniform was that of current St. Louis Cardinals managing partner and chairman William DeWitt, Jr. who was a 9-year-old batboy for the Browns at the time. Gaedel came out of a papier-machecake between games of a doubleheader at Sportsman’s Park in St. Louis to celebrate the American League’s 50th anniversary. The stunt was also billed as a Falstaff Brewerypromotion. Falstaff, and the fans, had been promised a “festival of surprises” by Veeck. Before the second game got underway, the press agreed that the “midget-in-a-cake” appearance had not been up to Veeck’s usual promotional standard. Falstaff personnel, who had been promised national publicity for their participation, were particularly dissatisfied. Keeping the surprise he had in store for the second game to himself, Veeck just meekly apologized. Although Veeck denied the stunt was directly inspired by it, the appearance of Gaedel was unmistakably similar to the plot of “You Could Look It Up,” a 1941 short story by James Thurber. Veeck later insisted he got the idea from listening to the conversations of Giants manager John McGraw decades earlier when Veeck was a child. Gaedel entered the second half of the doubleheader between the Browns and Detroit Tigers in the bottom of the first inning as a pinch-hitter for leadoffbatter Frank Saucier. Immediately, umpire Ed Hurley called for Browns manager Zack Taylor. Veeck and Taylor had the foresight to have a copy of Gaedel’s contract on hand, as well as a copy of the Browns’ active roster, which had room for Gaedel’s addition. The contract had been filed late in the day on Friday, August 17. Veeck knew the league office would summarily approve the contract upon receipt, and that it would not be scrutinized until Monday, August 20. Upon reading the contract, Hurley motioned for Gaedel to take his place in the batter’s box. (As a result of Gaedel’s appearance, all contracts must now be approved by the Commissioner of Baseball before a player can appear in a game.) The change to that day’s St. Louis Browns scorecard, listing Gaedel and his uniform number, had gone unnoticed by everyone except Harry Mitauer, a writer for the St. Louis Globe-Democrat.The Browns’ publicity man shunted Mitauer’s inquiry aside. With Bob Cain on the mound—laughing at the absurdity that he actually had to pitch to Gaedel—and catcher Bob Swift catching on his knees, Gaedel took his stance. The Tigers catcher offered his pitcher a piece of strategy: “Keep it low.” Cain delivered four consecutive balls, all high (the first two pitches were legitimate attempts at strikes; the last two were half-speed tosses). Gaedel took his base (stopping twice during his trot to bow to the crowd) and was replaced by pinch-runner Jim Delsing. The 18,369 fans gave Gaedel a standing ovation. Veeck had hoped that Delsing would go on to score in a one-run Browns victory, but he ended up stranded at third base and the Tigers went on to win the game 6–2. American League president Will Harridge, saying Veeck was making a mockery of the game, voided Gaedel’s contract the next day. In response, Veeck threatened to request an official ruling on whether Yankees shortstop and reigning American League MVP Phil Rizzuto, who stood 5’6″, was a short ballplayer or a tall dwarf. Initially, Major League Baseball struck Gaedel from its record book, as if he had not been in the game. He was relisted a year later, as a right-handed batter and left-handed thrower (although he did not play the field).Eddie Gaedel finished his major league career with an on-base percentage of 1.000. His total earnings as a pro athlete were $100, the scale price for an AGVA appearance. However, he was able to parlay his baseball fame into more than $17,000 by appearing on several television shows.